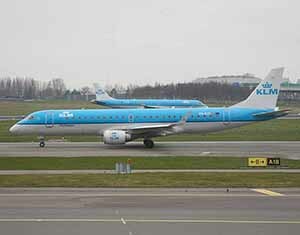 KLM is to use a 100-seat Embraer 190 on its new double daily service from Dublin fo Schiphol to commence October 30. KLM become the third carrier on the route after Aer Lingus and Ryanair. Aer Lingus codeshare with KLM on Dublin-Amsterdam will remain in place. Flight KL935 from Amsterdam to Dublin will depart at 12:00 hours and arrive at 12:40 local time. Flight KL936 will depart 13:15 hours, arriving at Amsterdam Airport Schiphol at 15:50 hours. The evening flight (KL939) will leave Amsterdam at 21:20 hours and arrive at 22:00 hours. The return flight (KL932) will depart the following morning at 05:55 hours, touching down in Amsterdam at 08:30 hours. It is the 78th European destination that is operated directly by KLM from Amsterdam. The schedule has been devised to complement KLM’s long-haul network, offering passengers easy connections to destinations such as Johannesburg, Havana, Beijing and Hong Kong. For transfer passengers, KLM also offers various daily flights in cooperation with Aer Lingus between Amsterdam and Dublin. Pieter Elbers, KLM President & CEO said improvement in our results has been translated into growth in KLM network. Having introduced a record number of new destinations in the summer of 2016, the new destination Dublin is another proof of KLM keeping on investing in its network to offer customers an ever-broader range of destinations. Fares will start from €99 return from Dublin to Amsterdam. Flights are open for sale from today on the airline’s website www.klm.com, at KLM Reservations on 003536590442 and ltravel agents.